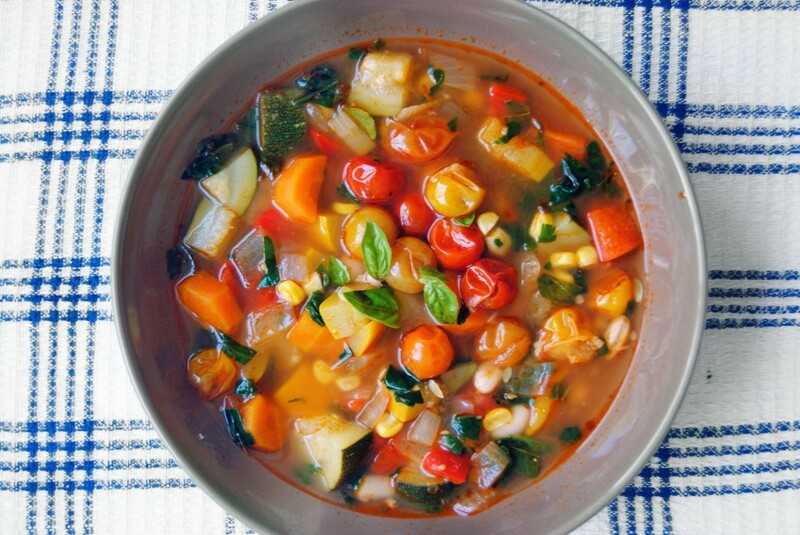 This minestrone is overflowing with summer vegetables, greens and herbs, but what really sets it apart is the addition of whole roasted cherry tomatoes. It’s fresh, healthy and delicious. This is my third summer here in Portugal! While that doesn’t make me an expert, I felt like this year I knew what to expect. August, for example, is usually the hottest month of the year, with temperatures in the upper 80s and even 90s. I remember that last year, I’d walk to work at 9AM and arrive there a sweaty mess. I don’t even want to talk about the late afternoon… let’s just say it’s no wonder that half of Lisbon goes on vacation in August! It’s perfect beach weather, perfect nap weather, but not really perfect work weather. This year has not been typical though, and to my surprise, the summer has been quite cool so far. So cool, in fact, that I’ve been a bit oven-crazy this summer. I’ve been baking and roasting like it’s nobody’s business. This week, I committed warm-weather treason and made a soup - yes, a HOT soup – which on top of already being a hot soup, requires roasting tomatoes. I know that some of you are suffering through 100 degree weather and I’ll admit that this soup probably isn’t the best idea for you right now. The thing is, while it’s not the best soup to make on a hot summer day, it is the absolute best soup to eat on a hot summer day. Think about it. It’s packed with summer veggies and fresh herbs. The tomatoes are roasted whole and then added to the soup at the very end, so that they burst in your mouth, giving this already fresh and delicious soup a touch of sweetness. Serve it just slightly warm, and it really is an awesome summer dinner. So, when a cooler evening comes along, make a big batch to last a couple of days. You won’t regret it – I promise! 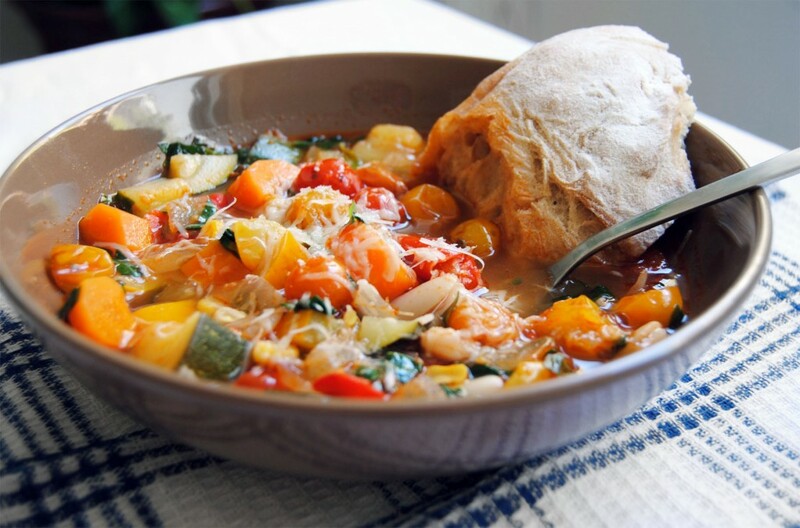 Did you know that “minestrone” means “big soup”? So, make it a big soup! Add as many summer veggies, fresh greens and herbs to this as you want. You may need to add a bit more broth, so have some handy. In the winter, I like to put pasta in my minestrone (or if we’re being honest, minestrone in my pasta), but in the summer I usually leave it out. The beans are enough to make this a hearty meal without being too filling. Nobody likes food coma in the summer. Feel free to add some pasta to this, though, if that’s your thing. It would still be delicious! If you’ve been throwing out the rinds of your parmesan cheese, you stop that this instant! They add awesome flavor to soup. Just chuck it in there and fish it out in the end. Same thing goes for corn cobs. These ingredients are optional, of course, but they really do make a difference in flavor. One other note: I used whole cherry tomatoes, but very small ones. If you use a larger variety, cut them in half. Preheat oven to 400ºF/200ºC. Spread tomatoes on a sheet pan. Drizzle with olive oil, and season with salt and pepper. Roast until the tomatoes begin to collapse (usually around 10-15 minutes). Heat about 3 tablespoons of olive oil in a large pot over medium-high heat. When the oil is hot, add onion and carrot along with a pinch (just a pinch!) of red pepper flakes and cook until the onion is translucent (5-7 minutes). Add bell pepper, zucchini, squash, corn and garlic. Cook until the vegetables start to soften (8-10 minutes). Add the veggie broth, tomato paste, corn cob and parmesan rind. Bring the soup to a boil. Reduce heat and let soup simmer for about 15 minutes, until the vegetables are tender but not mushy. Add the spinach, basil, thyme and parsley. Cook for another 2 minutes until the spinach is completely wilted. Remove from heat and add the white beans and roasted tomatoes, along with all the juices from the pan. Mix well and season with salt and pepper to taste. Remove the parmesan rind and corn cob. Top with grated parmesan and serve with nice crusty bread. Life is always better when there’s nice crusty bread. I’ll try this when–or IF—it cools off here in California! Looks and sounds delicious! I just harvested lots of cherry tomatoes from the garden. I’ll definitely make this tomorrow for dinner–thanks! Perfect to use all that summer veg. Yum! Let me know how it turns out. We did it! It was delicious, and despite their protests initially, they loved it. We made noodles and poured the kids soup over noodles, we did ours lower-carb, gluten-free style without. Served with cornbread; and there’s enough for lunch tomorrow. Thanks for the inspiration! Great recipe! I made it this weekend and my family loved it! I made a few subsitutions though, green beans for the squash and zucchini on account for the abundance of beans in my refridgerator and the lack of squash with the short growing season this year. I was also wondering if you know if you discard the parmesan cheese rind after one use in the soup? I have never used cheese rind to cook with before so if you have an insight let me know. Hi Meredith! Thanks for your comment. I’m glad you liked the soup, and those substitutions sound great. I love green beans! About your question, I don’t reuse the cheese rinds but you could give it a try. I’m not sure how much flavor would be left in them, though. Good luck!